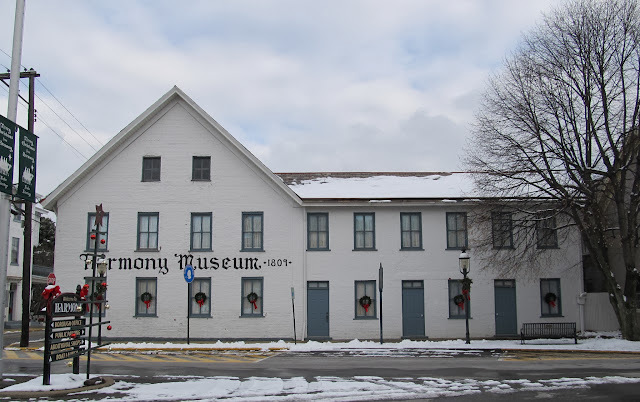 Highlights of our recent visit to Pennsylvania continue with the historic town of Harmony, Pennsylvania. It is the nearest town to the farm where Neal grew up. The current population is listed at 937 and the whole town is about 1/2 square mile. The town of Harmony or Harmonie, as it was originally named, was established in 1804 by a communal group known as the Harmony Society or Harmonites. The Harmonites lived here for ten years and sold the town to Mennonites before moving on to Indiana in 1815. I have always enjoyed visiting Harmony so let's take a tour. Along the town square is the Harmony Museum. 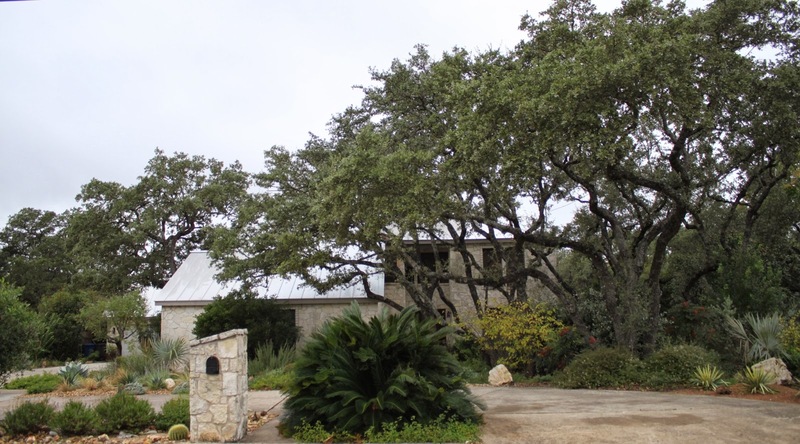 It was built by the Harmonites in 1809 and has an amazing vaulted wine cellar in the basement. It's closed on Mondays so we couldn't go inside on this visit. 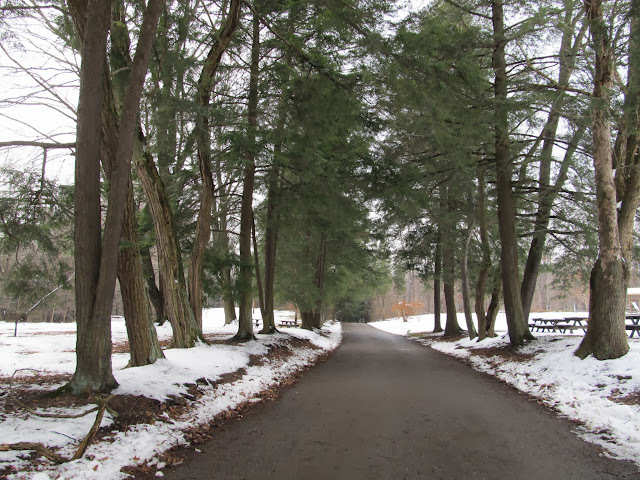 Throughout December I've been sharing tours around Western Pennsylvania from our recent visit. You can read about our visit to local Amish country here. From Volant we headed over to McConnell's Mill State Park to see Slippery Rock Gorge and the second covered bridge still in use in Lawrence County. The drive through the park starts off with tree-lined roads and picnic areas. The evergreens are Hemlock which are a fixture here. 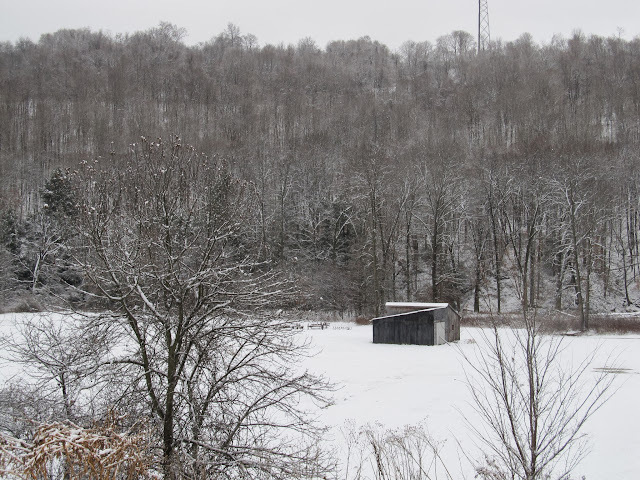 Throughout December I've been sharing highlights of our recent visit to the Fox family farm near Harmony, Pennsylvania. Today we'll take in some of the sights in the surrounding countryside as we visit the Amish country of Lawrence County and drive across a covered bridge. 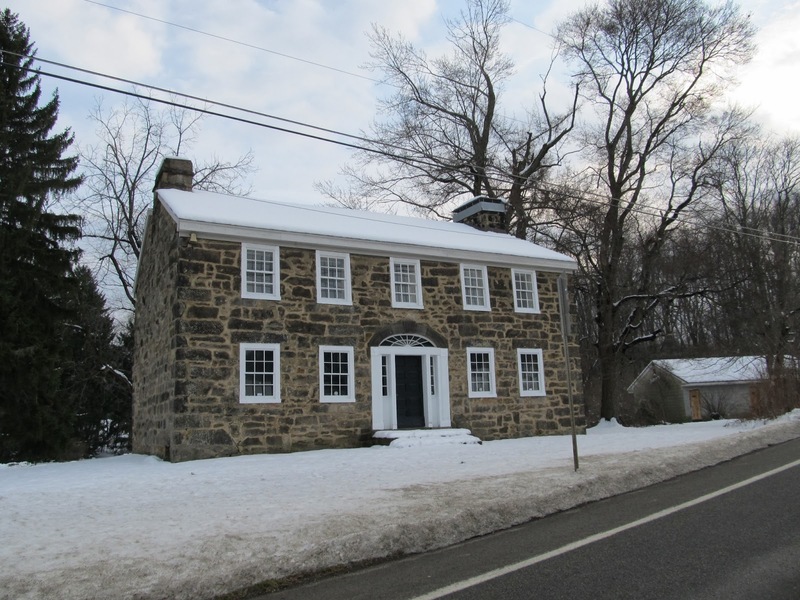 Old stone houses like this one built around 1837 as a tavern are common in the area. Around the Block: Merry Christmas Y'all! It's traditional to share a few of the displays around my neighborhood for Christmas and this year is no different so we're taking a brief break from our tours of western Pennsylvania to show you a few fun things from an evening walk around the block. New neighbors up the street display a Texas-style (and sized) greeting. It must be 6' tall. The first plant they added was a Texas Mountain Laurel 'Silver Peso' (not shown) which is my favorite native plant and a nice addition to the street. They might be Texans--just guessing of course. Our holiday tour of the beautiful Phipps Conservatory in Pittsburgh continues with Part 2. You can find Part 1 here. After touring the galleries on the east side of the conservatory we went back through the center Palm Court. 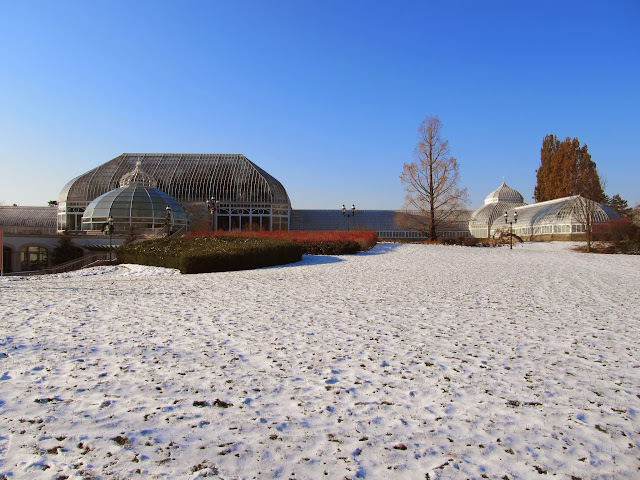 On the Friday after Thanksgiving we toured the Phipps Conservatory and Botanical Gardens in Pittsburgh. Built in 1893 it's a Lord & Burnham building just like the U.S. Botanic Garden Conservatory we visited earlier in the week while in Washington D.C. Two conservatories in one week decked out for the holidays set a good holiday mood. Phipps is located in Shenley Park near both Carnegie-Mellon University and the University of Pittsburgh just east of downtown. 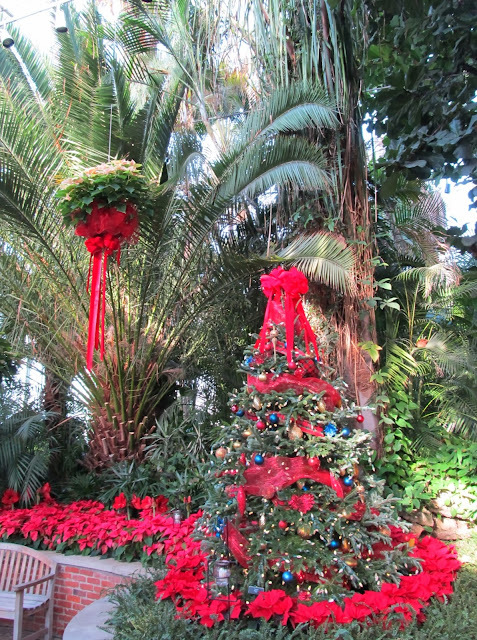 Although it looks a bit understated compared to the more dramatic placement of the U.S. Botanic Garden, the Phipps is much larger with impressive holiday displays. Too big to get in one photo from the sidewalk, this is just the right side of the building. We left Washington DC late on Tuesday evening headed for "Pennsylvania and some homemade pumpkin pie" just like the song "Home for the Holidays". Neal's mom lives on the family farm in rural western Pennsylvania, which was our Thanksgiving destination. It was raining like crazy and the temperature was hovering right around freezing as we eased our rental car into the miles-long backup on the GW Parkway awaiting our turn to join the traffic jam known as the Capitol Beltway. It was 7:30 pm and just like old times. Too much so, as we remembered the last time we made this drive in the rain it took about nine hours to go 275 miles. We decided the best option was to stay south of the snow line and headed west across the top of Maryland on I-68. (Sorry Texas, California, Florida, but Maryland wins hands down for the oddest shaped state. Look it up.) We drove through an ice storm at Sideling Hill while cheering for the salt trucks which were doing a great job keeping the roads passable. 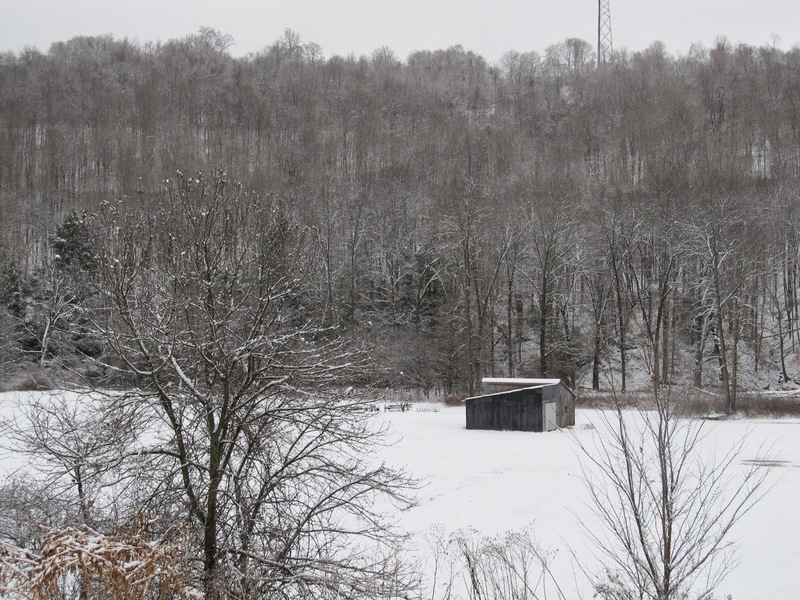 Just north of Morgantown, West Virginia, the rain turned to snow and began piling up on the hillsides. More than six hours after we started out Neal's brother met us at the Pittsburgh Airport where we dropped off the rental car and headed north another half hour to Harmony. We finally arrived at Neal's mom's house at around 2 am. It had taken planes, trains, and automobiles to get us to the family homestead for Thanksgiving. We awoke to a snowy Wednesday morning. I've been here for Thanksgiving many times and have never seen more than a few flurries. It was very cold but we just had to go for a walk while there was still a bit of snow falling and I had never seen the farm in snow. It was incredible. 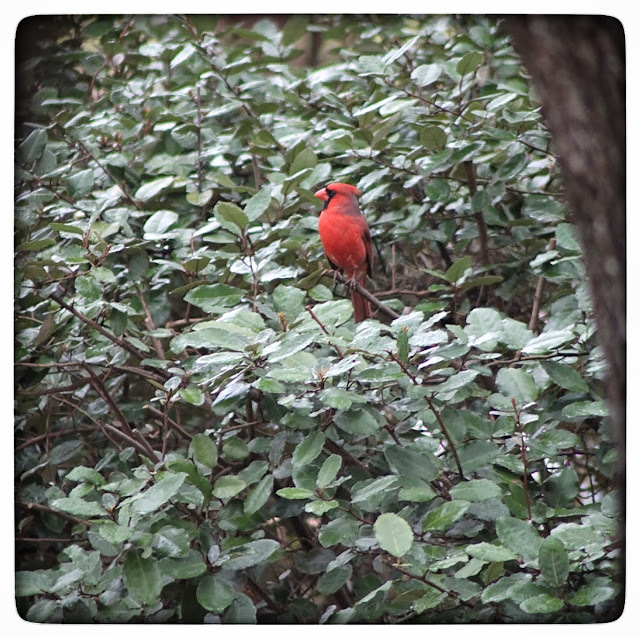 The camera was not set to monochrome--these are the colors of a gray, snowy day. The now-empty pasture used to hold a small herd of cattle. There is a creek at the far end of the pasture beyond the barn. During Thanksgiving week we spent a few days in Washington DC, you can read about our tour of the U.S. Botanic Garden Conservatory and nearby Bartholdi Park in my previous posts. 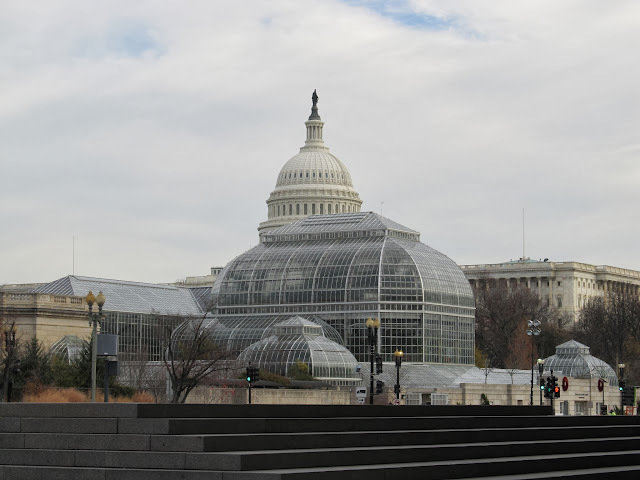 After touring Bartholdi Park and the conservatory we took advantage of the sun peeking through the clouds and walked northeast across the National Mall toward Union Station. First a look at the gardens surrounding the conservatory. On the west side of the Conservatory are more outdoor gardens. The building with the curved terraces in the background is the Museum of the American Indian which I referenced in my post on the conservatory. On a Thanksgiving week trip to Washington D.C. we took some time to enjoy the sights. You can read about our tour of the conservatory at the U.S. Botanic Gardens in my previous post. 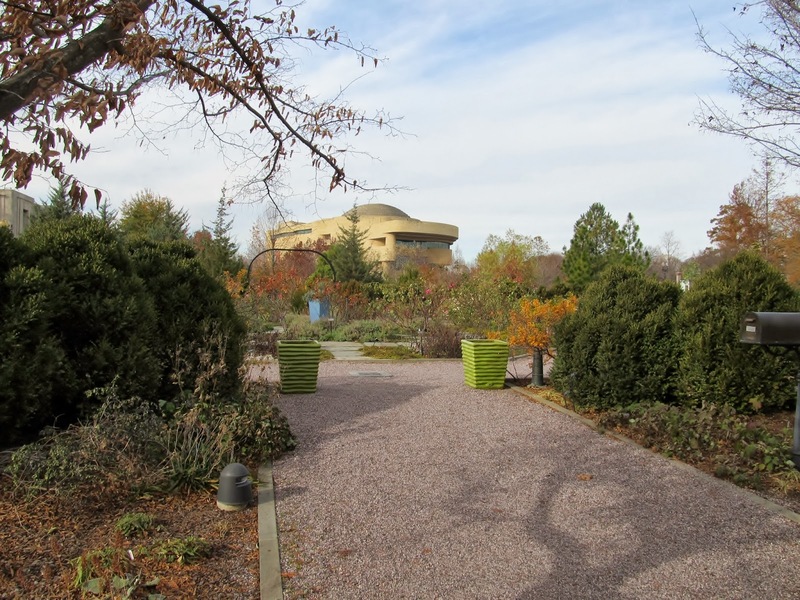 Even though it was very cold we enjoyed visiting Bartholdi Park across Independence Avenue from the conservatory. 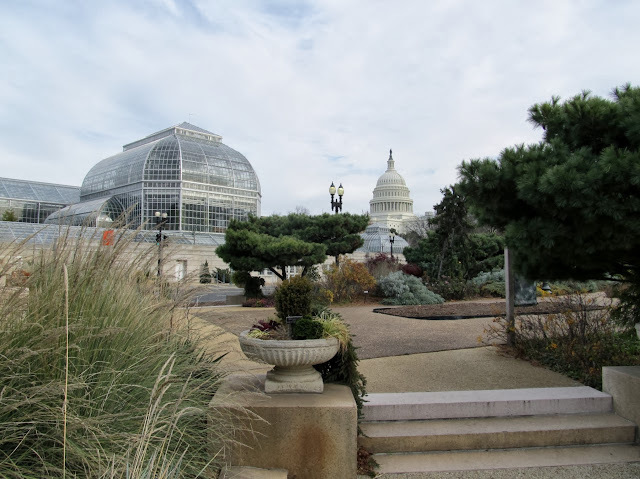 A business trip to Washington DC during Thanksgiving week for my husband had me tagging along and I knew the conservatory of the U.S. Botanic Garden had to be at the top of my must-see list. Neal's schedule allowed just enough time for him to join me. It was fun to be tourists in a city we know so well even if only for a few hours. The gardens and conservatory are literally in the shadow of the U.S. Capitol and quite a striking sight. The gardens were founded in 1816 and the conservatory was built by Lord & Burnham in 1933. This blogging journey has introduced me to many new people with fascinating gardens which I have tried to share. One of my new-found friends is Melody who lives relatively nearby so she shares most of my gardening challenges. She is an accomplished gardener and her gardens are beautiful but also have many fun surprises. Let's take a tour. The gate and long gravel driveway says "way out in the country" but Melody lives about two miles closer to San Antonio than I do. I didn't start out to create a butterfly garden--it just happened. 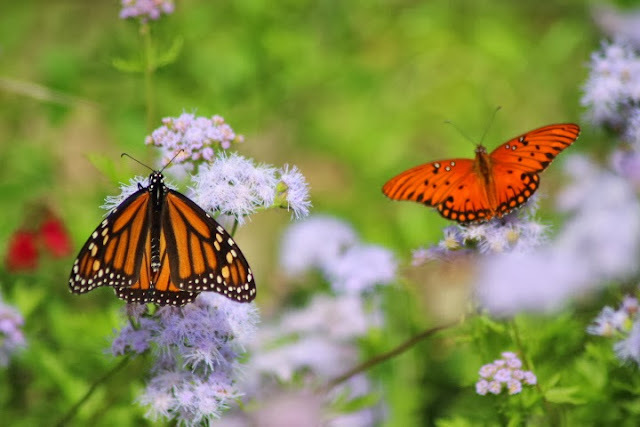 As much as we enjoy the circle garden in the backyard it seems the butterflies appreciate it even more since the native plants which do best in that spot are also popular with the butterflies. While we have butterflies much of the year, the fall and spring migrations bring many different species through San Antonio on their way to and from Mexico. Are butterflies multilingual? Maybe another discussion. They are so much fun to watch and try to identify. Thanks to the internet I've been working on my ID skills so I can share my itinerate visitors from the last few weeks. Monarch left and Gulf Fritillary on the right. The first of each month I join Heather at Xericstyle to post a wide shot of my garden. While it's fun to focus on the prettiest flowers in the garden the overall impression is what makes a landscape. The weather has been unseasonably cold here in South Texas with near freezing lows most nights and cloudy days for the past week. The front view of the garden does not change much throughout the year and that is by design. I planned and planted a scheme that would work with the house to present a consistent face to the street with minimal work. The yellowing Callicarpa americana leaves are still holding on though the Mockingbirds have taken care of most of the berries. These are among the very few non-evergreen shrubs in the front yard and they are set against the year round silvery green of Eleaegnus which needs a top trim soon. On the fourth Wednesday of each month I join Gail at Clay and Limestone for Wildflower Wednesday to celebrate flowering native plants in my garden. November's choice is Boneset. Researching plants is fun but when I find multiple common or botanical names for the same or similar plants it can be confusing. Such is the case with Bonesets. 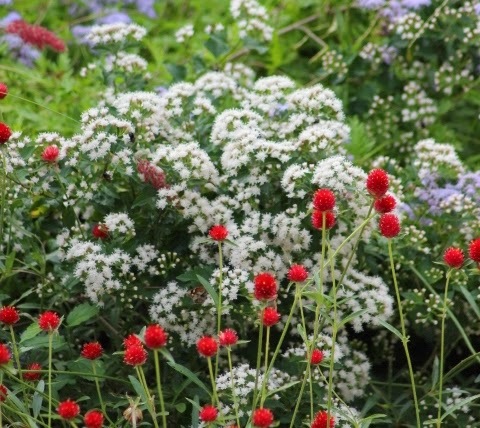 Boneset, Throughwort (Thoroughwort), Fragrant Mistflower, Havana Snakeroot, Agueweed, Crosswort, Indian Sage, are all names for Eupatorium havenense. 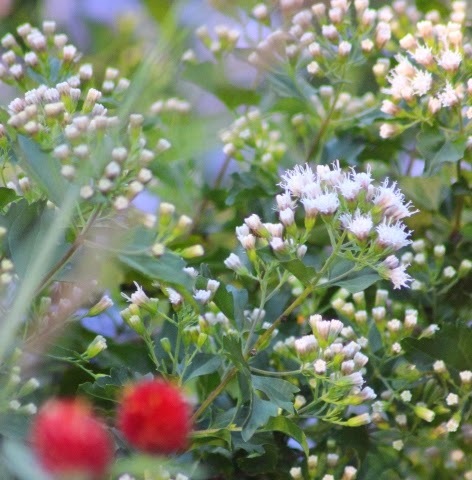 Very fragrant and highly attractive to bees, the white blossoms scent the air each fall. The term Boneset derives from early medicinal uses when a tea made from the plant was used to treat Denque Fever which was also known as "breakbone fever" due to the pain it caused. Throughwort or thoroughwort apparently refers to the way the stem appears to grow through the leaf although I couldn't quite see that in my garden. The San Antonio Watersaver Landscape Tour sponsored by the San Antonio Water System (SAWS) held each October encourages water wise gardening. This tour is an opportunity for homeowners and gardeners to see how their neighbors have replaced thirsty turf grass lawns. 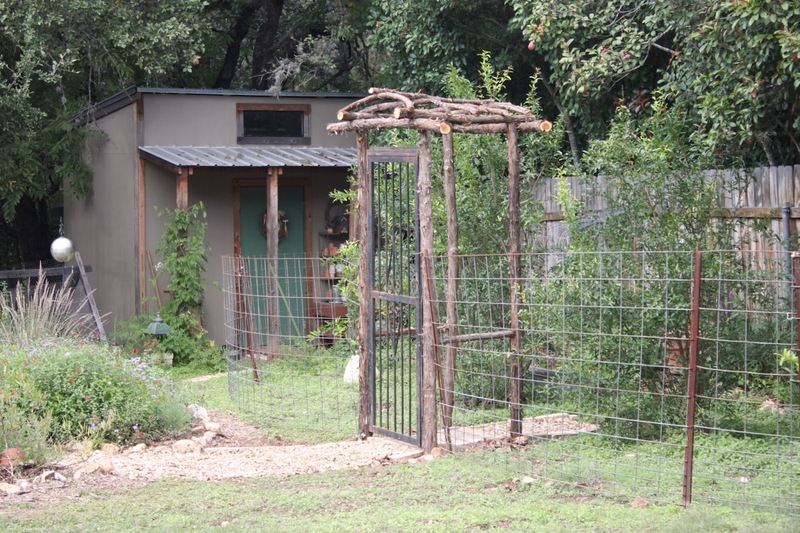 For the first post in the series you can look back at my post on the Sun Oak garden. Two neighboring yards in the Santa Fe Trails neighborhood with plenty of good ideas were featured as one stop on the tour. 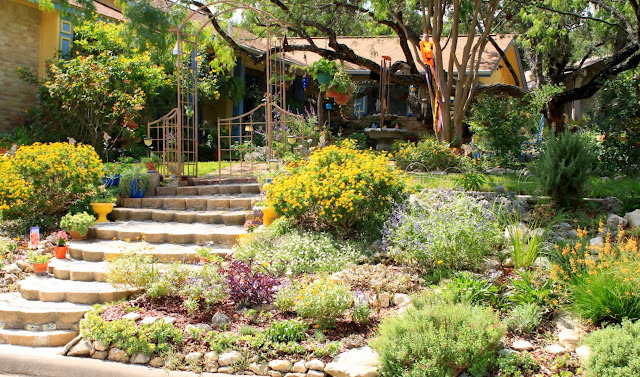 The first is a no-lawn front yard filled with art, cacti, succulents, and plenty of waterwise plants. How do you say goodbye to a special garden? At least we had a purpose in mind when my friend Melody and I arrived at the gardens of the now-closed Antique Rose Emporium in San Antonio recently. We were there to collect seeds for the Warrior and Family Support Center gardens where we volunteer. 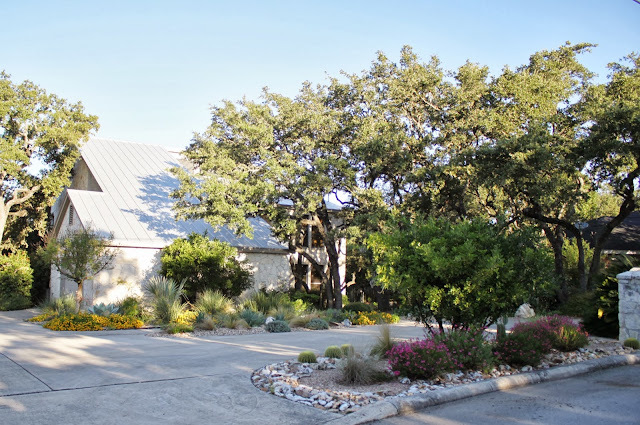 We also knew this would be our last chance to visit these gardens which had been a source of inspiration for so many San Antonio gardeners over the last fourteen years. At first glance from the parking lot very little had changed in the fifteen months since they closed their San Antonio location. Roses in full bloom greeted us just as I remembered from previous visits. Each month I join Pam at Digging for Foliage Follow-up on the day after Garden Blogger's Bloom Day which is the 15th and that should make this the 16th. I'm a day late this time and it's a good thing Pam is always flexible. November's choice is Cycas Revoluta or King Sago Palm. With our first cold weather of the season hitting this week I'm posting my annual garden roundup to show the gardens at their Autumn peak. In my last post I featured the front yard and today we'll tour the back yard. The centerpiece of the back yard is the circle garden created last year to cover a bare spot left by two years of extreme drought. 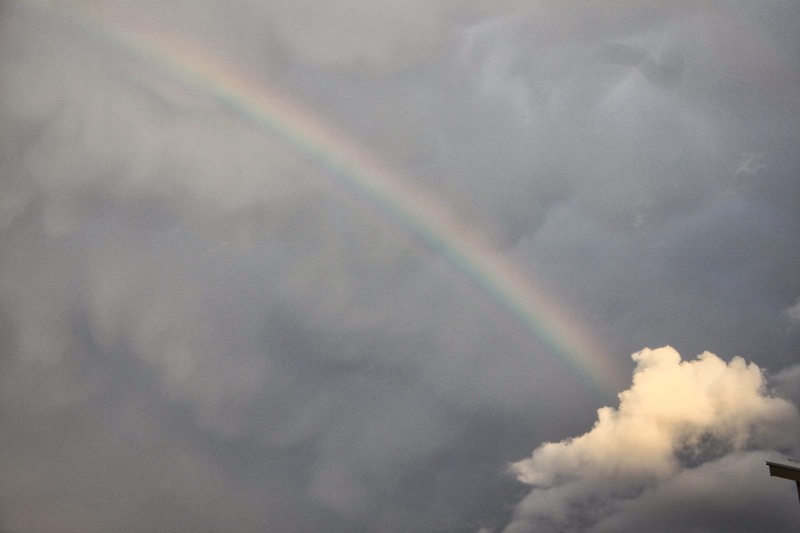 The weather is saying it's Fall as colder temperatures head our way. As always, we are grateful to the folks farther north for blunting the impact and accepting the worst of the cold front's effects. Anyway, it's time for my annual Autumn Garden Roundup before the garden fades for a few months. I've taken quite a few photos of the garden at its peak over the last week or so for your viewing pleasure. We'll begin in the front where there haven't been many changes this year. A little different view than I typically show is this approach from the front of the house out to the street. Yes, that's a lot of concrete. Concretious Americanus is very cold-hardy and was installed by the original owner who is also a contractor. It's Veteran's Day in the U.S, a holiday established to thank those who have served their country in the armed forces. Known as Poppy Day in Great Britain, red poppies are the traditional flower on this day. Poppies aren't blooming in my garden today, but I did find this appropriately red, white, and blue combination in the circle garden. 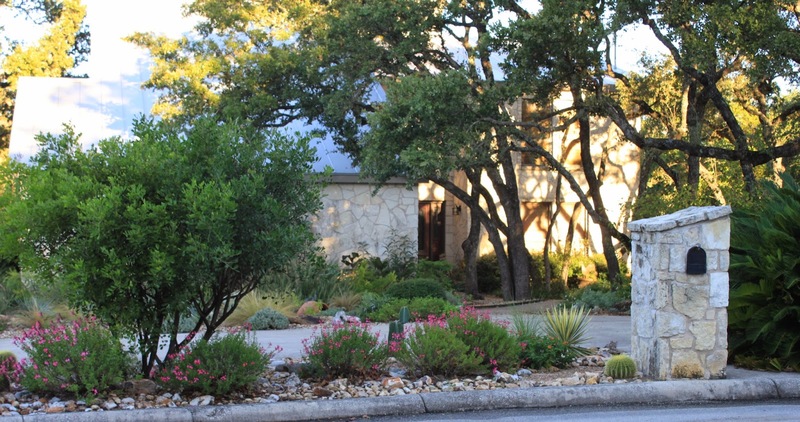 Each October the San Antonio Watersaver Landscape Tour showcases yards which have reduced the footprint of water-guzzling turf grass. 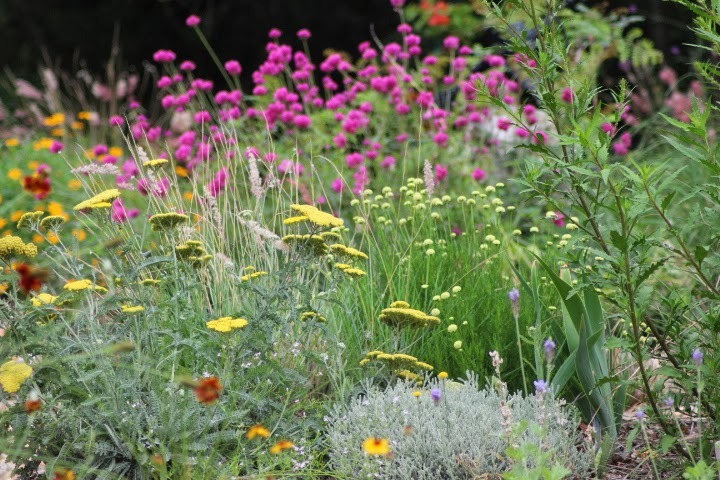 Some gardens stand out more than others, usually reflecting the distinct personality of the gardener. I'll feature one garden which is definitely full of personality. This colorful, cheerful garden is on a corner lot and these steps ascend from the side street. 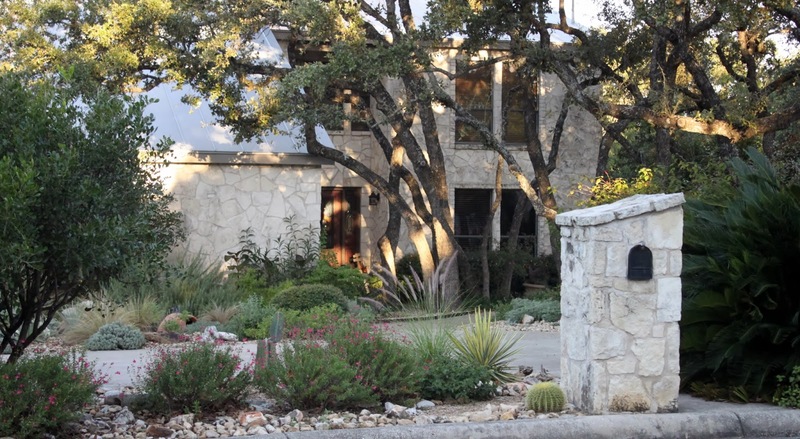 The gardens were listed by address and this one is aptly named by its Sun Oak location. Plenty of sunny perennials lead the way up to the live oak shaded front yard. The mostly blue and yellow garden matches the house trim colors. 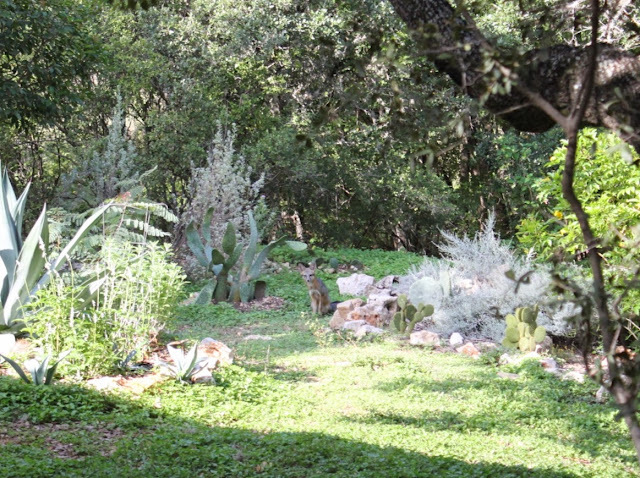 The first of each month I join Heather at Xericstyle for a wide shot of my garden. In keeping the view and timing close to the same I can track the changes in my garden throughout the year. Today's wide shot of the front yard shows an unnamed volunteer Pennisetum ornamental grass blooming next to the yucca by the mailbox. This plant seeded itself from my neighbor's yard and the bonus is learning this type of grass does very well in the front yard. I've tried growing ornamental grasses in this spot with mixed results and with this volunteer doing so well here I might try others in the future. 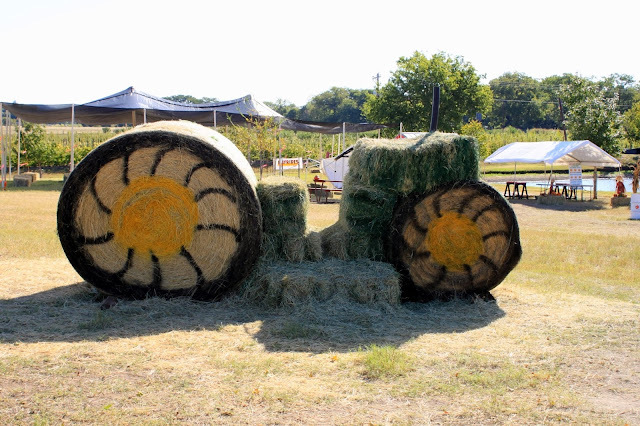 It's Fall in South Texas so it's time to head out to the Apple orchard. San Antonio is full of surprising gardens and gardeners and I had a chance to visit one recently. One significant contributor who helped make the Mitchell Lake Audubon Center gardens I posted yesterday such a beautiful place to visit was local plant collector Al Del Rio. I had the opportunity to visit Al's garden one evening last week. What a surprising visit it was! 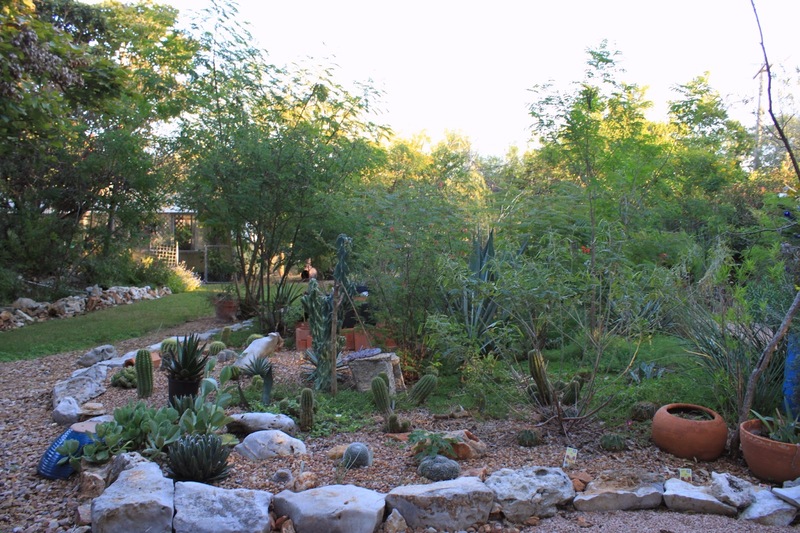 Let's get started in the back yard where Al has recently removed most of the lawn and added areas for cactus, agave, aloes, and other succulents. Last Saturday I joined friends at the beautiful Mitchell Lake Audubon Center just southeast of downtown San Antonio for their annual Fall Festival. 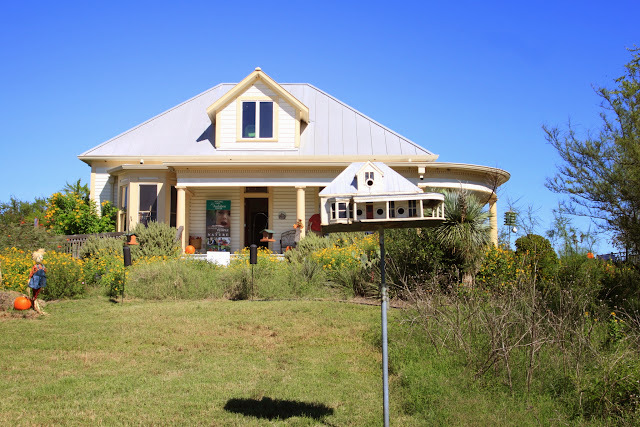 The local Audubon Texas group has restored this beautiful 1910 home as a center. The home was moved to the site from the McNay Art Museum east of downtown. During the month of October I'm joining Pam at Digging for Support Your Independent Nursery Month. Independent nurseries are especially valuable local resources for plants that grow best in our climates. 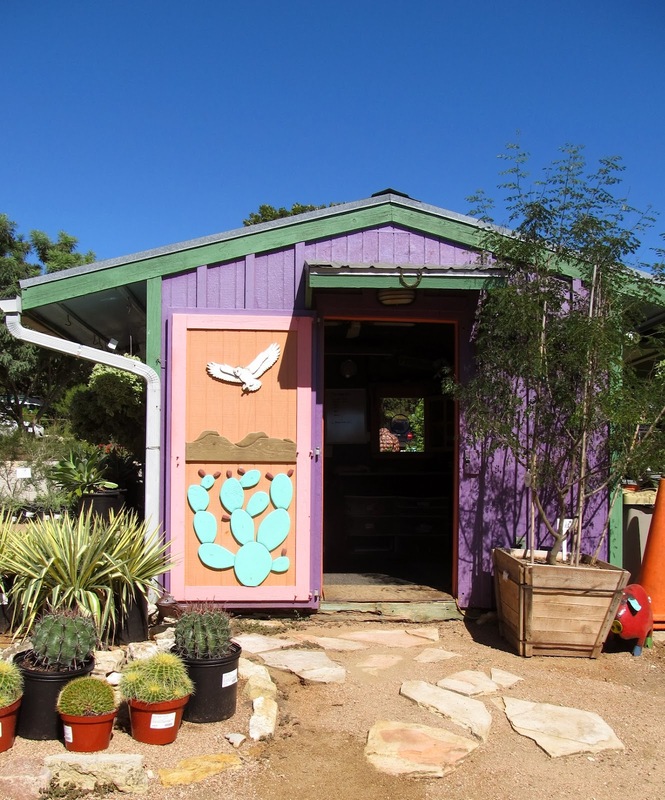 This week I'm featuring The Natural Gardener in Austin. 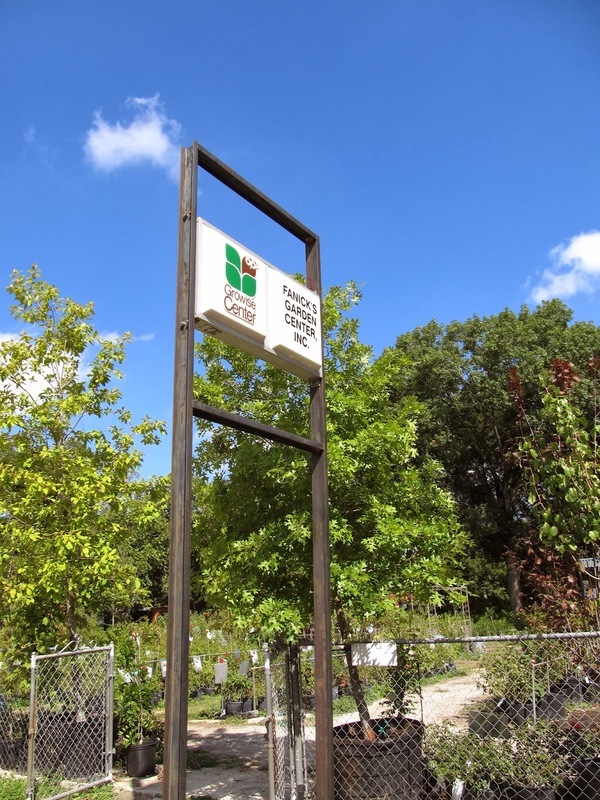 Another Austin nursery? When I visited The Natural Gardener back in February I knew I would enjoy returning to see how it looked later in the year. I got my chance when gardening friends invited me along on a plant shopping trip to Austin. In a previous post I wrote about our visit to Barton Springs Nursery and this time it's our stop at The Natural Gardener the same day. Since I covered much of the nursery grounds back in February I'll focus on some of the areas I missed and those that look best this time of year. Of course I always take time to visit the spiky plants and The Natural Gardener has plenty of them. Plant ABCs is an ongoing series where I highlight a plant from my garden for each letter of the alphabet. I'm currently going through the entire alphabet A - Z, then will continue updating and adding plants to the list over time. My previous posts in this series are on the "Plant ABCs" tab under the header. Today's letter is "T" and Tecoma stans is the choice. 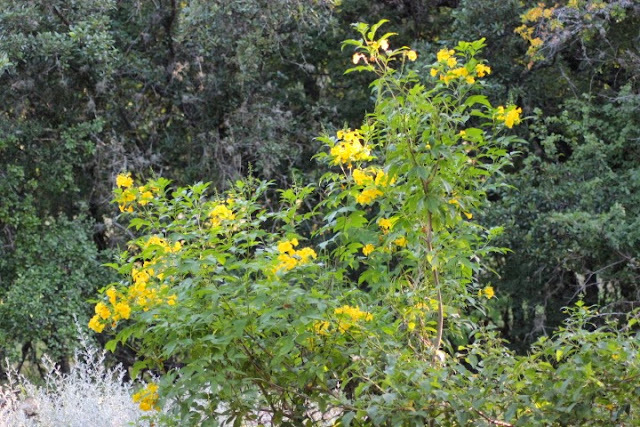 It's also Texas Native Plant Week so featuring Texas native Tecoma stans or Esperanza fits right in with this week's theme. Since last spring I've joined Gail of Clay and Limestone for Wildflower Wednesday to celebrate wildflowers in the garden on the fourth Wednesday of each month. 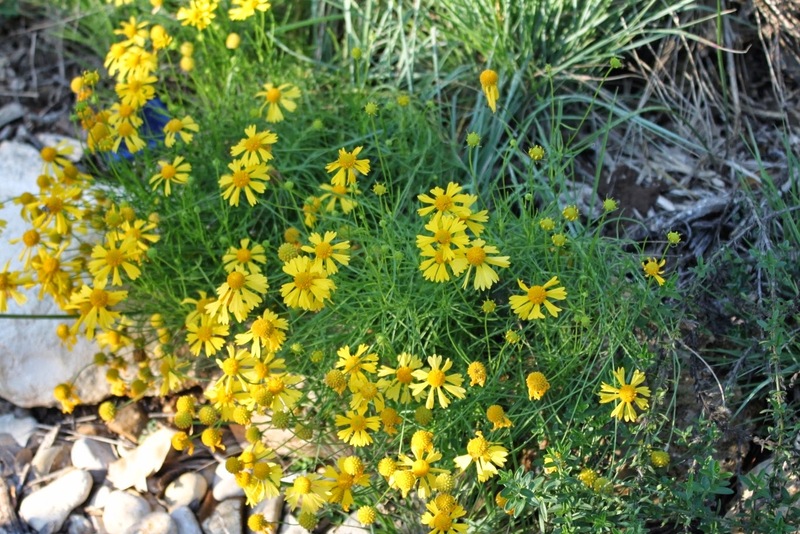 It's also Texas Native Plant Week so I'm celebrating both with a tour of native plants currently blooming in my garden. Collecting and growing native plants in my garden has become a bit of a quest for me since they do best in our challenging climate. October is when many plants look their best here after having recovered from the long hot summer and with several fall rains to help them along. Helenium amarum reseeded in this location from last year and should continue to grow along the gravel path in the circle garden. During the month of October I'm joining Pam at Digging for Support Your Independent Nursery Month. Independent nurseries are the best resource for plants which work well in our climate. It's also Texas Native Plant Week and I'm featuring my favorite native plant nursery. 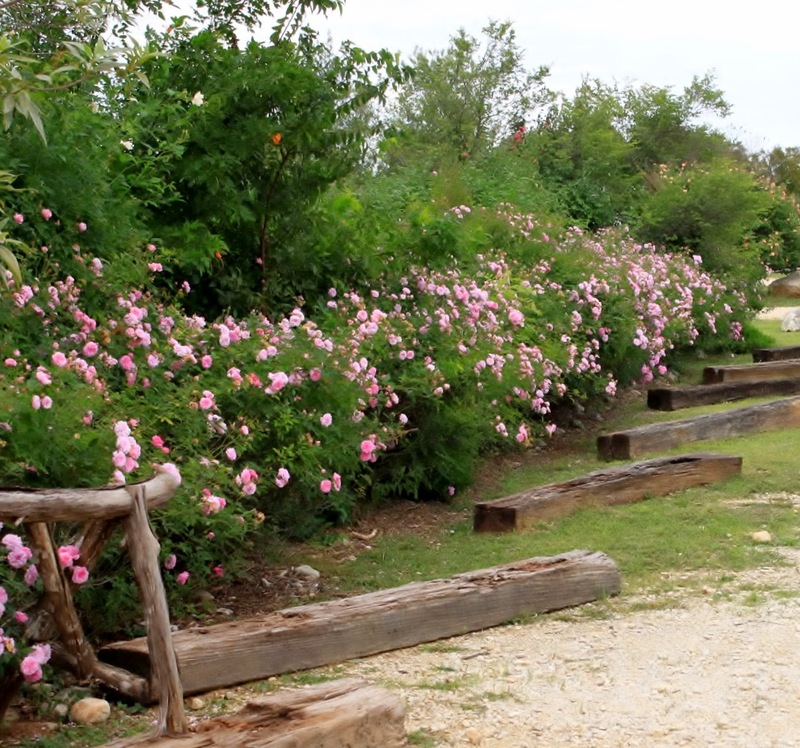 I recently re-visited Medina Garden Nursery just over an hour west of San Antonio with a group of gardening friends. Besides being a beautiful drive, it's well worth the trip just to spend time with native and butterfly plant expert Ernesto Carino. Ismael Espinoza, who usually works with him, was at his other job on this day so we missed him. We spent over two hours touring the nursery and gardens surrounding Ernesto's home. As I wrote in my previous post on Medina Garden Nursery, it's all about the plants. 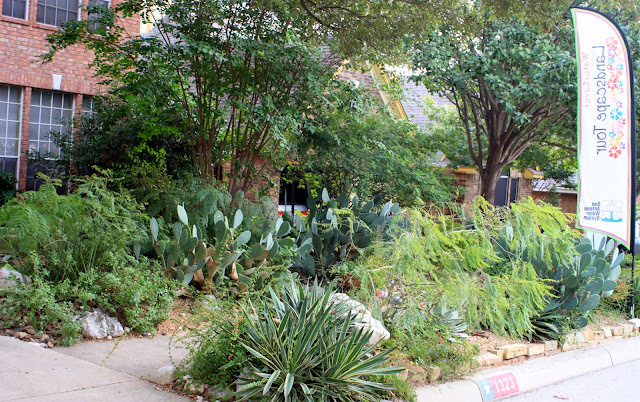 Texas natives and plants adapted to our tough Texas climate--they know what grows best where we live. They collect cuttings in the wild and trade with native plant enthusiasts from all over. Ernesto says he often receives seeds or cutting in the mail from those who just want to preserve native plants for future generations. During the month of October I'm joining Pam at Digging for Support Your Independent Nursery Month. Independent nurseries are especially valuable as a resource for locally grown and climate-tested plants. That's certainly the case with today's visit to Barton Springs Nursery. My Austin blogger friends might be just a bit surprised to see the title of this one. Barton Springs Nursery is still in Austin and I haven't moved but when local gardening friends asked me to join them on a plant shopping trip to Austin I quickly agreed and, based on recommendations from several Austin bloggers, added Barton Springs Nursery to the list. The short drive of just over an hour allows me to consider it "far north San Antonio but really southwest Austin" for blogging purposes. Over the last few years we have welcomed many wildlife visitors to the garden. 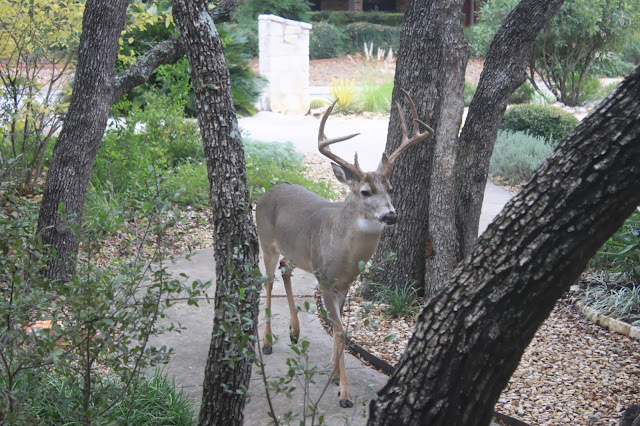 Yesterday we had a visitor we'd hoped to see for quite a while. We knew gray foxes lived in the area but had never seen one until now. 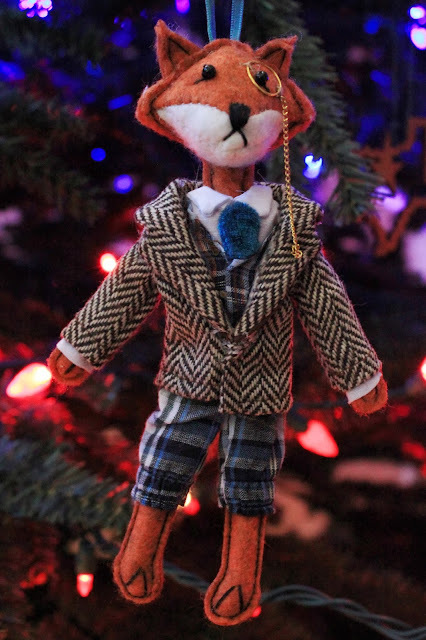 We call our home "Casa Zorro" because zorro is the Spanish word for fox (our last name) and I love to collect fox items for the house so knowing there are foxes visiting the yard is extra special. During the first week of this blog two years ago I posted "before and after" photos of my front yard to show changes over the past year. There's nothing magic about October 9th except it is a date for which I could find a "before" photo from my pre-blogging days. As I begin my third year of blogging I continue the tradition to take stock of the yard during what is typically a peak bloom season. The front landscaping today, October 9th, early this morning. Each week in October I'm joining Support Your Independent Nursery Month sponsored by Pam Penick at her blog Digging to highlight an independent nursery in the San Antonio area. 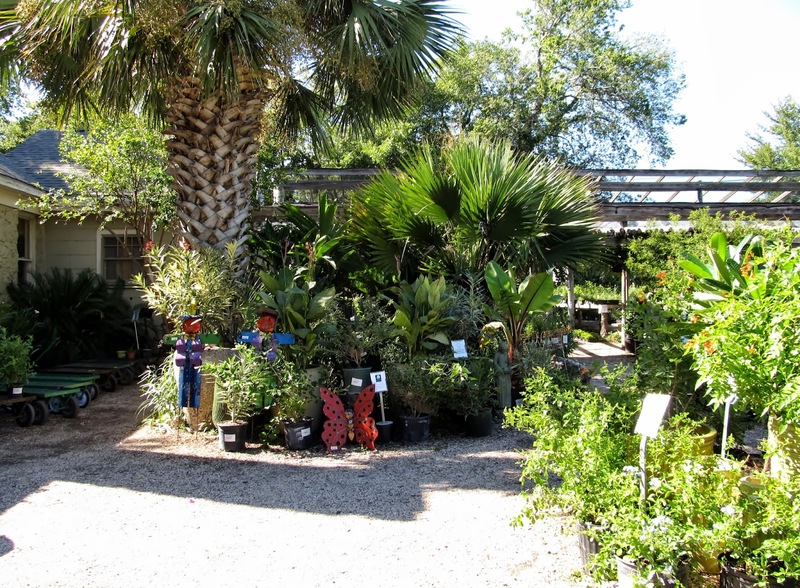 Locally owned nurseries provide an important resource to learn about and buy plants which grow best in our area and you can't get more local than Fanick's Garden Center on the southeast side of San Antonio. Fanick's is a throwback to the way shopping at garden centers used to be, and still is, because Fanick's Garden Center has been here since 1939 and is currently operated by Mark Fanick representing the third generation of his family to run the nursery. This blog is two years old today and, as it happens, it's also my 300th post. Two years and 300 posts is just a little less than three posts a week, so I guess I've been having fun...haven't I? Well it's been enough fun that I plan to keep on going. In celebration I'm sharing the story of this blog ("My Blog So Far...."). It is also Marilyn Monroe's birthday, the anniversary of Sputnik, and the day Janis Joplin died. Somehow my blog anniversary is not on the list of the important things which happened on October 4th. Yet. I've never been busted flat in Baton Rouge, but I have been beaten silly by the Texas caliche. Not much rhythm in there, but it feels similar. And I haven't orbited the earth, but I have circumnavigated my circle garden a few times. And regarding the seven year itch, that will be a post 5 years from now. 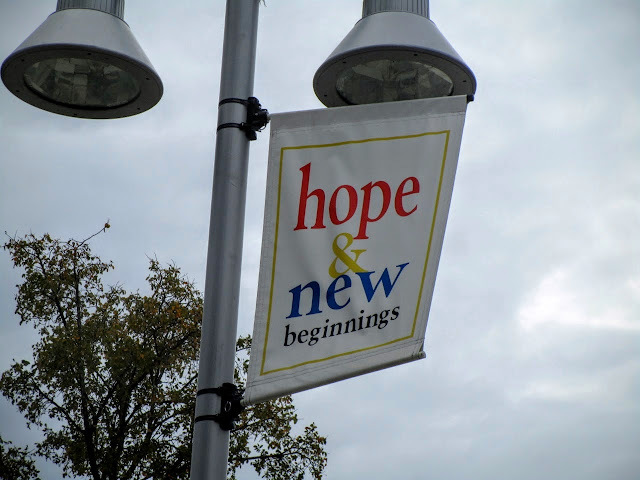 Anyhoo, back at the south 40, when we began planning our retirement move from Washington DC to San Antonio in the spring of 2008, I also began to search for landscape inspiration. In addition to the many excellent local gardening articles and radio shows offering advice, I knew I needed a lot more. I wanted a landscape that would reflect both my style and our region. October is Support Your Independent Nursery Month sponsored by Pam Penick at her Austin blog Digging. Each week during October I'll join in by posting a tour of an independent nursery in the South Central Texas area. Who better to supply us with the plants which grow best in our climate than nurseries owned and staffed by local gardeners? 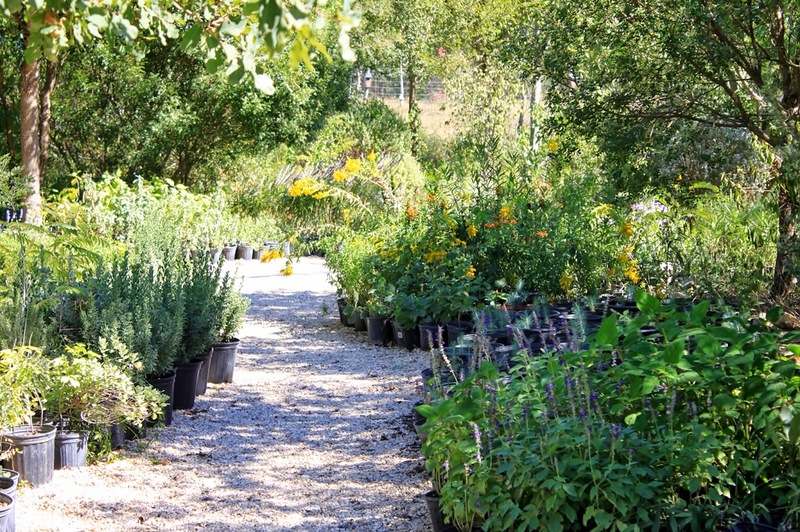 Local nurseries are an especially good resource for those of us who are turning more and more to native plants in the landscape. 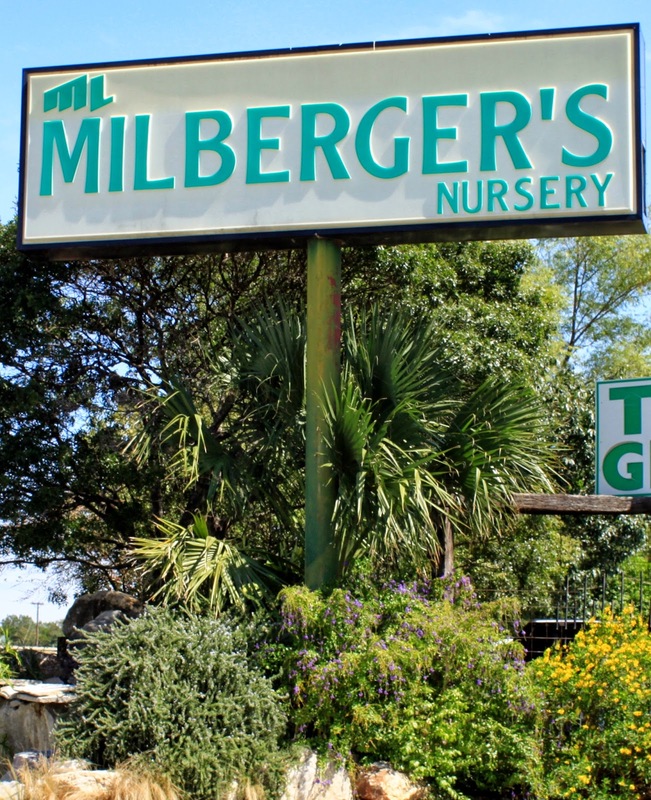 For my first independent nursery tour I'm revisiting Milberger's Nursery in San Antonio. Last October I posted their Spook-tacular Halloween display with a creepy maze and plenty of great decorations. On a recent visit I took additional photos to show you how pretty the nursery is on a typical day. 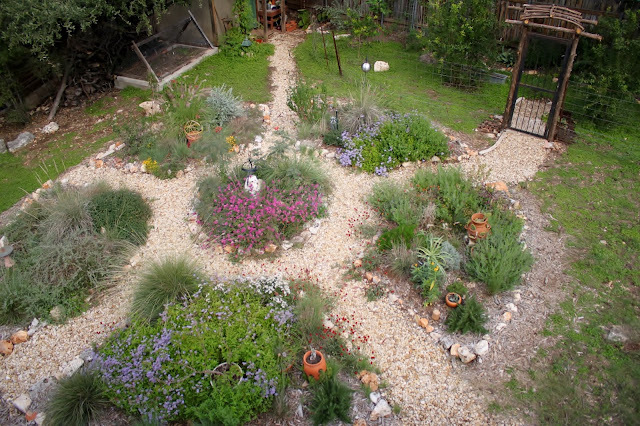 It's the first of October and I'm joining Heather at Xericstyle to show a wide view of my garden. At the beginning of each month Heather invites bloggers to show the big picture so readers can follow our garden progress. It's interesting to compare with my last wide shot post at the beginning of September when the shadows were quite different. The bright Autumn Sage or Salvia greggii is now blooming along the street. It's Wildflower Wednesday sponsored by Gail at Clay and Limestone where she invites bloggers to share stories of wildflowers in our gardens the fourth Wednesday of each month. For September 2013 I'm featuring purple performers and Rain Lilies in the fall garden. 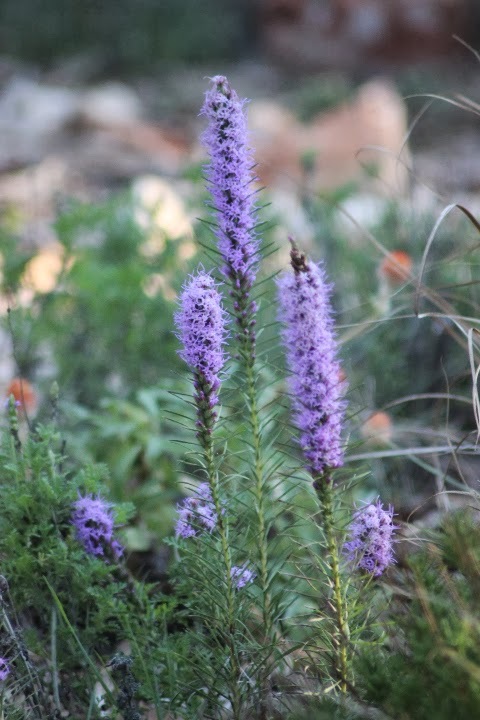 The much-anticipated Liatris or Gayfeather is blooming this week. Another plant generously shared by Michael at Plano Prairie Garden last year. He's not sure exactly which variety this is so he's listed it as Liatris somethingorother in his plant list. I do know for sure it is a striking color in the fall garden. The plants have begun to spread out in their second year in my garden and look better this year compared to last year when they were newly planted. It's the first day of autumn and we made it through a particularly brutal summer here in San Antonio, so time to look for seasonal changes in the plants. The traditional fall colors so common in northern climates are rare in South Texas. After a few days of rain a "cold front" blew in and dropped our daytime highs all the way down to 91F/33C. I've been outside several hours each day planting and transplanting to take advantage of the beautiful weather. While we do have a few pockets of maples and a several other plants which will change color this season, our weather typically remains quite warm right up until the calendar says winter. That doesn't mean we don't have our own signs of fall. 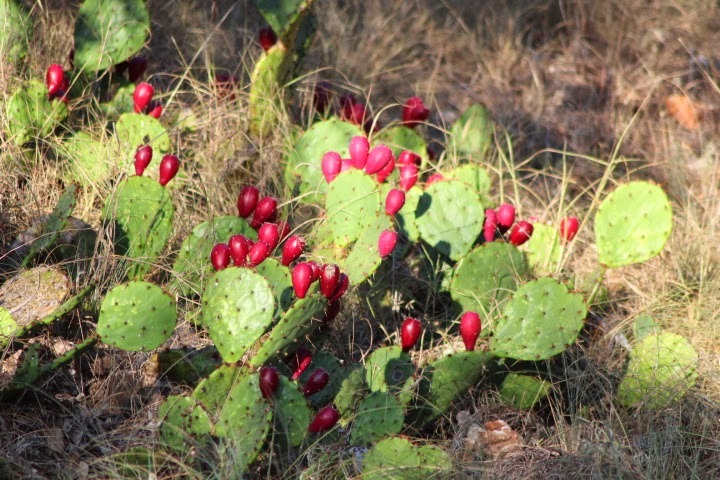 One sign is the ripening of the Tunas or prickly pear fruit of the Opuntia cactus. In the arroyo across the creek behind the house these are bright red. 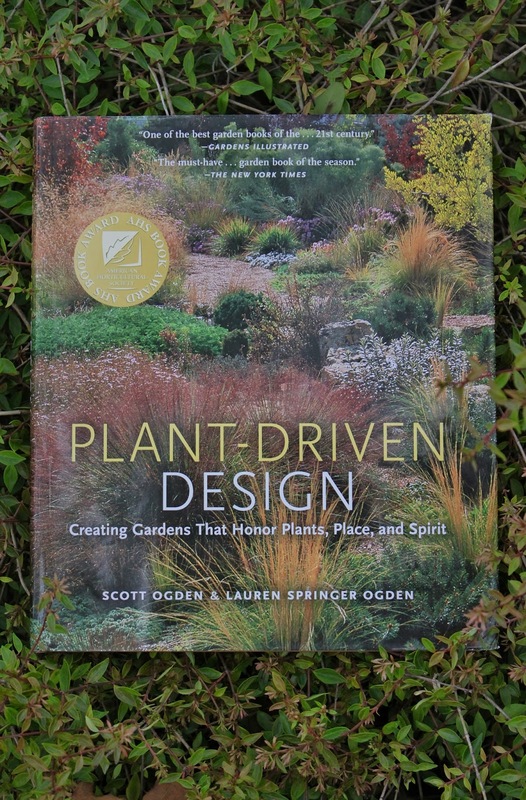 It's garden book review time so I'm joining Holley at Roses and Other Gardening Joys for her garden blogger's book review meme on the 20th of each month by reviewing Plant Driven Design: Creating Gardens That Honor Plants, Place, and Spirit by husband and wife team Scott and Lauren Springer Ogden. Wordless Wednesday: Birdie Hot Tub! It's not easy to find fall colors in South Texas. By the time we experience anything approaching fall weather it will be nearly winter on the calendar. I'm joining Pam at Digging for Foliage follow-up on the 16th of each month to show off the foliage in our gardens. 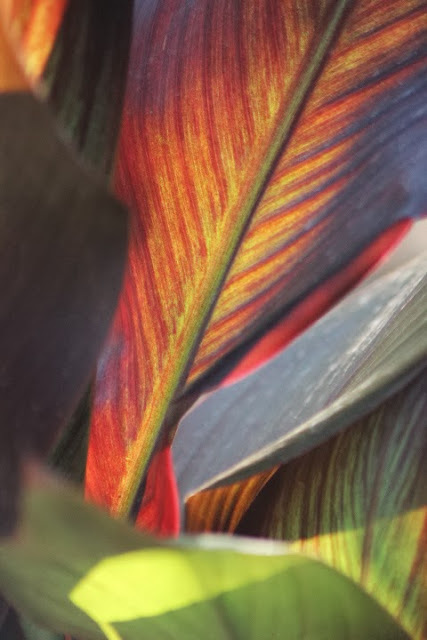 So with the Autumn season approaching quickly I went in search of fall colors in our near triple digit temperatures and found...Cannas. Just for a few moments forget that these plants are here all summer and enjoy. Canna Tropicanna in matching planters by the front door. The sweetest, dearest, best mother-in-law in the world is celebrating her 85th birthday today. Since she reads my blog, I think it would be fun to wish her a Happy Birthday here. Back in July I headed over to Los Patios on Loop 410 in San Antonio to check out the first House to Home Vintage Market show and see the park-like grounds of the private event center. 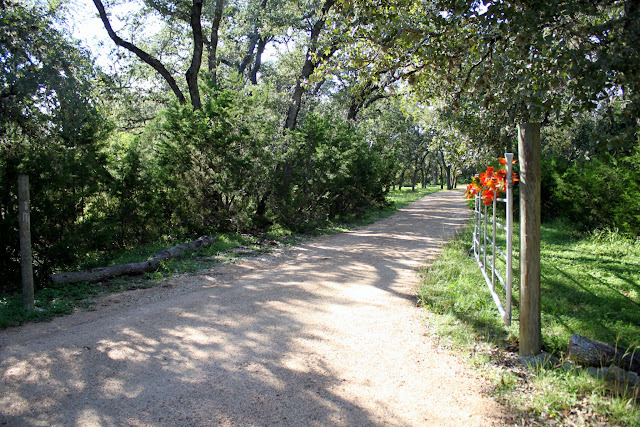 Los Patios is along the the Salado Creek Greenway trail which is part of a city-wide trail network and is a beautiful place to spend a few hours right in town. The show was in this very Texas-style wood building near the parking lot.